El embajador de Bangladesh recibe el saludo del Presidente de Paz y Cooperación, Joaquín Antuña, en presencia de su esposa, Lina. 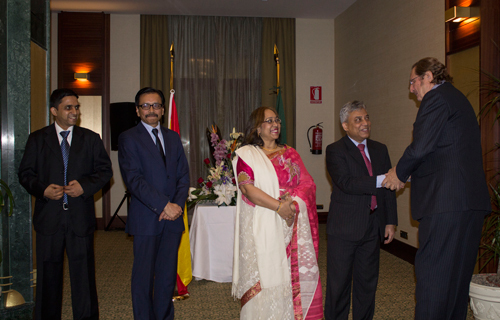 On the occasion of the commemoration of the National Day and Independence, Bangladesh Ambassador in Spain, Ikhtiar M. Chowdhury and his wife Lina Choudhury (pictured, receiving greetings from the president of Peace and Cooperation, Joaquín Antuña) offered on March 26th a reception at the Intercontinental Hotel in Madrid, ceremony attended by many ambassadors from Asia and Europe, Oceania and Africa. During the cocktail was held a protocol ceremony where the national anthems of Bangladesh and Spain were interpreted. Then the host said a few words to the crowd and thanked their presence to all the guests. He also highlighted the excellent bilateral relations between Bangladesh and Spain. In his speech made special mention of all his countrymen resident in Spain and asked them to continue working to achieve progress and social welfare. The ambassador also highlighted the remarkable economic takeoff of Bangladesh, which currently is the second textile power in the world only behind China. Therefore invited all Spanish entrepreneurs to invest in Bangladesh and finished making a toast for both countries. Among the many guest there were lecturers, artists, writers, people from the world of science, the judiciary, journalists, and many members of the colony of Bangladesh in Spain. Text: E. Guaylupo / Pictures: Lara Rubio. Dcha a izda: Ignacia Iribarren; Lina Choudhury, esposa del embajador de Bangladesh; Teuta Robo, esposa del embajador de Albania; el embajador de la República Popular Democrática de Corea, don Kim Hyok Chol, junto a su esposa; la interiorista Esther Izquierdo y el ex embajador de Líbano, Chucri Abboud. Ambassador of Bangladesh, Ikhtiar M. Chowdhury, and ambassadress of South Africa, Fikile Sylvia Magubaneen, cut the cake for the anniversary of the Independence of the Asian country in the presence of the ambassador of Algeria, Mohammed Haneche. Bangladesh Ambassador Don Ikhtiar M. Chowdhury, addresses those gathered for the National Day of his country. Left to right: Alvvya Chowdhury; Begur Rokeya y el periodista Chaklader M. Alam. Political counselor of the Embassy of the People’s Republic of China in Spain, Huang Yazhong, with his wife, Wang Liying.